This article is about the TCG Booster Pack. For the OCG Booster Pack, see Duelist Pack: Legend Duelist 4. If you control a WIND Winged Beast Monster: Until the end of this turn, negate any monster effects your opponent activates. If you control a “Harpie” monster, you can activate this card from your hand. If this card in its owner’s Spell & Trap Card Zone is destroyed by an opponent’s card effect: You can add 1 “Harpie’s Feather Duster” from your Deck or GY to your hand. This card’s name becomes “Harpie Lady” while on the field or in the GY. 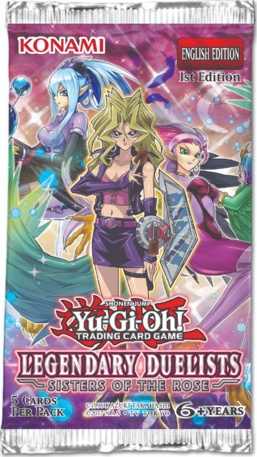 If this card is Normal or Special Summoned: You can add 1 Spell/Trap from your Deck to your hand that specifically lists the card “Harpie Lady Sisters” in its text. If you controlled a Level 5 or higher “Harpie” monster when you activated this effect, you can also add a second such card, with a different name from the first. You can only use this effect of “Harpie Perfumer” once per turn. You can Ritual Summon this card with “Machine Angel Ritual”. If this card is Ritua Summoned: You can make your opponent send 1 Spell/Trap they control to the GY. When this attacking card destroys an opponent’s monster by battle and sends it to the GY: You can activate this effect; this card can make a second attack on an opponent’s monster in a row. Once per turn, when your opponent activates a card or effect that targets a “Cyber Angel” Ritual Monster you control (Quick Effect): You can shuffle 1 Ritual Monster from your GY into the Deck, and if you do, destroy 1 card your opponent controls. Tribute 1 “Cyber Angel” Ritual Monster from your hand or field; draw 2 cards, then place 1 card from your hand on the bottom of the Deck. For the rest of this turn after this card resolves, you cannot Special Summon monsters, except Ritual Monsters. You can only activate 1 “Merciful Machine Angel” per turn. If this card is Special Summoned: You can add 1 “Black Garden” from your Deck or GY to your hand. You can banish this card from your GY, then target 1 “Rose Dragon” monster or 1 Dragon Synchro Monster in your GY; Special Summon it. You can ony use each effect of “Garden Rose Maiden” once per turn. If a Tuner(s) is Special Summoned (except during the Damage Step): You can Special Summon this card from your hand. If this card is in your GY: You can send 1 card from your hand or field to the GY; place this card on the top or bottom of your Deck. You can only use each effect of “Dark Rose Fairy” once per turn. Special Summon “Rose Tokens” (Plant/DARK/Level 2/ATK 800/DEF 800) in Defense Position to either field, up to the combined number of cards in the Field Zones and Field Spells in the GY. If this card is in your GY: YOu can target 1 “Black Rose Dragon”, or 1 Plant monster, in your Monster Zone; banish it, and if you do, place this card on the bottom of the Deck. During the next Standby Phase, return that banished monster to the field. You can only use this effect of “Blooming of the Darkest Rose” once per turn. Must be Fusion Summoned. Gains 200 ATK for each Beast-Warrior monster that is banished or in the GYs. Your opponent cannot target this card with card effects. During your Main Phase, except the turn this card was sent to the GY: You can banish this card from your GY, then target 1 Fusion Monster you control, it gains 3000 ATK, until the end of this turn. You can only use this effect of “Lunalight Sabre Dancer” once per turn. If this card is Normal or Special Summoned: You can send 1 “Lunalight” card from your hand to the GY, and if you do, draw 1 card. If this card is sent to the GY by card effect: You can target 1 of your Level 4 or lower “Lunalight” monsters that is banished or in your GY, except “Lunalight Emerald Bird”; Special Summon it in Defense Position, but negate its effects. You can only use each effect of “Lunalight Emerald Bird” once per turn. If this card is in your hand or GY: You can target 1 “Lunalight” card you control, except “Lunalight Yellow Marten”; return it to the hand, and if you do, Special Summon this card in Defense Position, but banish this card when it leaves the field. If this card is sent to the GY by a card effect: You can add 1 “Lunalight” Spell/Trap from your Deck to your hand. You can only use each effect of “Lunalight Yellow Marten” once per turn. Fusion Summon 1 “Lunalight” Fusion Monster from your Extra Deck, using monsters from your hand or field as Fusion Material. If your opponent controls a monster that was Special Summoned from the Extra Deck, you can also use 1 “Lunalight” monster in your Deck or Extra Deck as Fusion Material. You can only activate 1 “Lunalight Fusion” per turn. • Special Summon 1 “Lunalight Token” (Beast-Warrior/DARK/Level 4/ATK 2000/DEF 2000) to your opponent’s field. • That target gains 500 ATK for each monster your opponent controls (even if this card leaves the field). During your Main Phase: You can banish this card from your GY; send 1 card from your hand to the GY, and if you do, Special Summon 1 “Lunalight” monster from your Deck. You can only use this effect of “Lunalight Serenade Dance” once per turn.